Working at home is not always pretty. 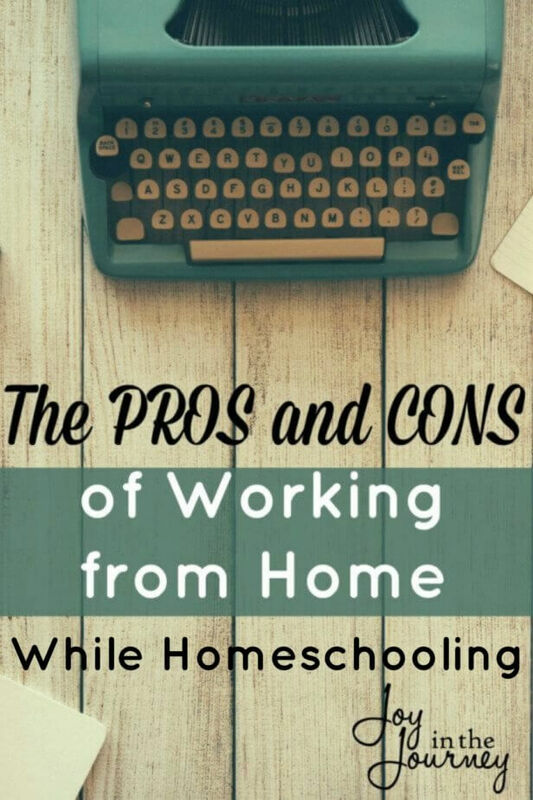 Here are a few pros and cons of working from home straight from a working homeschool mom of 11 years! The kids wake up and wander into my room. They find me working. Staring at a screen. I glance up for a moment and say good morning. Sometimes this results in hugs sometimes they say it back and walk away. Regardless, I continue working. You see I work from home. And we homeschool. This means I have to do my best at homeschooling while working from home. Our days are full of lessons and life and the normal mom stuff. So, I try to work as much as I can I the morning. You can see my homeschool mom schedule here (Weekly Work Schedule) and read more about our routine in this post. I don’t regret being a working homeschool mom. I love it. But, the reality is it’s not always pretty and while there are many pros to working from home, there are also cons. Yes, even though I work from home, I miss things. Two evenings a week the hubby does the bedtime routine and one night a week they have a family movie night. I’m not there. I can hear the giggles coming from the other room, but I’m not there. Sometimes this is hard. Sometimes I hate it. But, I do it anyway because…. Yes, even though there are things I DO miss. There are also many things I don’t. Because I work from home I have not worked outside the home since 2005. That means for over 11 years I have been able to live life as a stay at home mom. And still, bring in an income. This has allowed me to homeschool the kids. It has allowed me to attend field trips, and read books, go to story time, teach our kids how to read and be there for the boo boos and the sicknesses. I know that had I not went the work at home mom route there is a good possibility we would have never started homeschooling, to begin with. However, even though there has been stress the kids have also been able to witness real life. They have seen how I handle the stress. 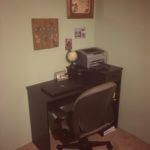 They have seen me balance work and life and motherhood and homeschooling. If I worked outside the home they’d have little to no knowledge of my job. They wouldn’t see the prayer that comes when my patience is short. They wouldn’t see me struggle with how to manage my time and they wouldn’t see a huge part of my life. By working from home I am hoping I am modeling to my girls time management skills and the real life example we are called to show the younger generation in Titus 2. One of the biggest challenges of working from home is saying NO. Working from home means I’m not always free to say YES to the extra things like teaching co-op, babysitting a friends baby, that last minute play date at the park. I don’t like disappointing people, and I don’t like missing out on things that are FUN. 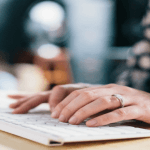 But, working from home means that sometimes we have to say NO to things we want to say YES to. By learning to say no I have also learned to truly give my best yes. Every decision is weighed. And by saying NO to things I’m able to say YES to that extra book, my husband, and homeschooling to the best of my ability. By learning to give my best yes I have STOPPED homeschooling out of negligence and I have been able to recuperate from a year of burn out. Working from home while schooling at home means that as moms we have to learn to earnestly seek God’s will in every avenue of our lives. It allows us to manage our time more efficiently. We learn how to say NO to the things that take away from our best yes. Still Want to School at Home while Working from Home? 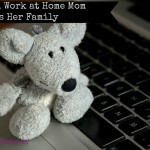 Working from home while homeschooling has been a huge blessing to our family. It has allowed for us to pay for the extra things like piano, and art, and braces. It has allowed me to model time management skills in front o my children, and truly evaluate what my best yes is. It has allowed me to stay home with my children and not miss out on the important things. If you want to school at home while working from home you CAN do it! Are there cons? Of course! Every avenue of our life will have good and bad qualities. But the pros are worth it! For more information about schooling at home while working from home check out my book! This is excellent advice and good to keep in mind. I find all of these statements to be true and I have to remind myself of this often.